Since its inception in 1986, Highland Hardwoods has always been and will continue to be environmentally conscious company. We are totally committed to do all we can to help protect and manage our natural resources, not only for ourselves but for future generations as well. The Hardwood forests of North America are some of the most valuable, diverse and productive forests in the world. These forests act as living filters, removing carbon dioxide from the atmosphere and replacing it with oxygen. Through proper management and utilization our hardwood forests will remain healthy and continue to meet our present needs without compromising the long-term needs of the future. This is called sustainable forestry. The good news for all of us is that trees, unlike many other resources, are naturally renewable. The U.S. Forest Service publication “Forests Of The United States” states that there are 82% more hardwoods growing today than 40 years ago. That means that we are growing more hardwood trees than we harvest each year. Today there are over 2 million people in the U.S. and Canada who collectively play an important role in managing and caring for our forests. Everyone at Highland feels a great sense of responsibility in how we handle the hardwoods that come out of our forests. We work closely with hardwood lumber producers who practice sustainable yield forestry techniques in their timber harvesting programs. Our company belongs to and supports many regional and national forest products associations who promote wise stewardship and multiple use of our nation’s forest lands. Most importantly, we firmly believe that education regarding our forest resources is the key to the future. Highland Hardwoods is proud to be an underwriting sponsor of New Hampshire’s “Project Learning Tree” which is committed to teaching our children about our forests. In addition, we have created a modest library of books, pamphlets, educational literature, offering a wealth of information about our environment, our forests and the hardwoods that we carry. Our library is available to everyone who walks through our doors. We truly feel this is important role we can play in helping to educate the general public with factual information about our treasured natural resources. We are very excited to announce that as of July 1st 2015, Highland Hardwoods will be running on solar energy ONLY! We are committed to manage and protect our natural resources, not only for ourselves but for future generations as well. 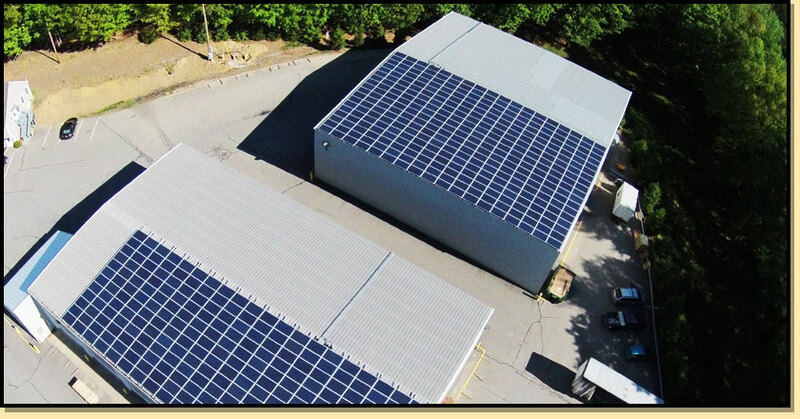 Two years in the making, Seacoast Energy from Barrington NH began installation of solar panels on two of our large lumber storage buildings in late April, and the work is now completed! There are two separate solar systems using Astronergy 225 watt panels and SolarEdge 20 kilowatt bolt inverters. The systems run separately and will provide electricity for Highland Hardwoods, with energy to spare! We plan to donate some of the excess electricity to the Brentwood Police and Fire Department. Solar Electric systems are a stable source of power, requiring virtually no maintenance and likely to run for the next forty years. Energy production for a year could be as high as 180292 kilowatt hours!